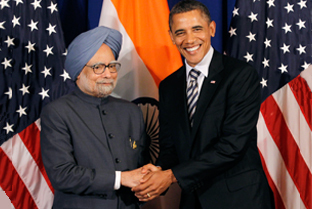 Applauding bilateral defense cooperation, including trade and military exercises, President Obama and Prime Minister Singh expressed satisfaction with the progress achieved to date in defence relations. They emphasized the need for more intensive defense cooperation on both sides. The Leaders reaffirmed their desire to further strengthen defence trade cooperation endorsing a Joint Declaration on Defence Cooperation as a means of enhancing their partnership in defence technology transfer, joint research, co-development and co-production. President Obama encouraged the further participation of US firms in partnering India’s efforts to enhance its defence capacities. President Obama also welcomed India’s decision to participate in the Rim of the Pacific (RIMPAC) naval exercise hosted by U.S. Pacific Command in 2014. President Obama and Prime Minister Singh strongly condemned the September 26 terrorist attack in Samba in Jammu and Kashmir. They reiterated their condemnation of terrorism in all its forms, and reaffirmed their commitment to eliminating terrorist safe havens and infrastructure, and disrupting terrorist networks including Al-Qa’ida and the Lashkar-e-Taiba. The Leaders called for Pakistan to work toward bringing the perpetrators of the November 2008 Mumbai attacks to justice.